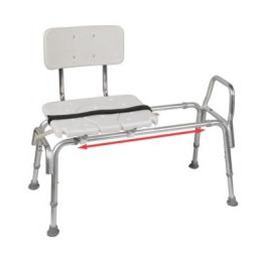 Transfer Bench with Cut-Out Molded Seat Back with removable cut-out panel in seat for personal washing. Blow-molded plastic seat and back with textured finish. Replaceable cut out seat allows for perinea washing. Seat platform slides smoothly over polished, high-strength aluminum tubes. Rust-proof, all-aluminum construction. Adjustable height to fit both user's needs and bathtub wall clearance. Strong suction tipped legs prevent movement on wet surfaces.